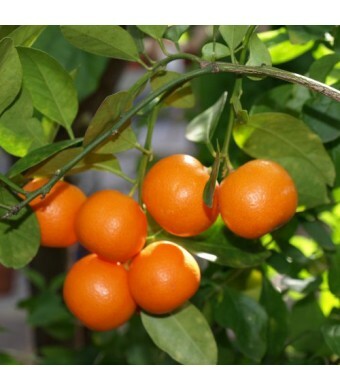 Calamondin Orange Trees are the Most Popular Potted Citrus on the Market! Not Available in Arizona, Alaska, California or Hawaii. Calamondin, Citrus mitis, is an acid citrus fruit that originated in China and was introduced to the U.S. as an "acid orange" around 1900. This plant is grown more for its looks than for its fruit edibility. It performs well as a patio plant or when trimmed as a hedge. Calamondin is cold hardy in USDA Growing Zones 9-11. It is hardier to cold than any other true citrus species---only the trifoliate orange and the kumquat are more tolerant to low temperatures. 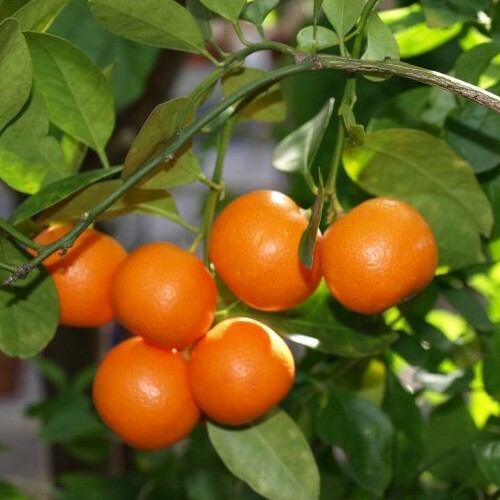 The Calamondin works well as a container-grown tree in all other growing zones. Simply bring your tree indoors for the winter. The small, edible fruit is orange and measures about one inch in diameter. The shape of the fruit resembles a small tangerine. The peel is thin and smooth, yellow to yellow-orange and easily separable. Calamondins are moderately drought-tolerant. Calamondin potted citrus plants prefer bright light for best growth and fruiting. You may keep them at medium light intensities during midwinter. The Calamondin orange is the most popular potted citrus, although Meyer lemons are also satisfactory for home use.